I have been overweight since elementary school. In High School, I was on the wrestling team but had to wrestle in the heavier weight classes. During my junior and senior year of High School, my parents signed me up for a “teen” weight loss program. I felt out of place because I was the oldest one there. Some of the other kids couldn’t even run a whole mile, but at that time I could. I had limited success with that program. In College I continued to put on weight. During my last year of college, the health center at school was running a free weight loss program. My wife encouraged me to sign up and the program worked pretty well for a while. At one point I got myself down to 300lbs. During that time I had a career change that required me to move to a new city and this threw off my schedule. I was off my exercise routine and started over eating again. I started to put the weight back on that I had lost. Life got busy. A few years later I had to deal with another life altering event…my wife was diagnosed with cancer. I took on the role of caretaker and did all that I could for her and continued to ignore my health. My wife passed away in 2010 and my primary care physician brought up concerns over my health. I could tell at that time how much more weight I had put on as stairs were difficult to clime and I would get winded easily. I finally decided it was time to take control of my health in 2012. I came in to see Dr. Lazarus and we discussed my weight related health issues and he helped me design a plan to bring my weight under control. I have gained so much back with the help of Dr. Lazarus and Clinical Nutrition Center. 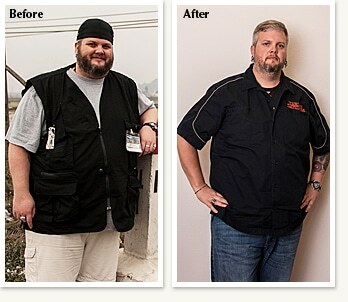 Take a look at my current before and after photo and you will see how far I have come! On the left: Feb 2011 Weight 350+ (wasn’t using the scale then). On the right: 7/19/2013 Weight 284. When I went in to talk to Dr. Lazarus I weighed 369. Today I have lost 85 lbs. and I am not interested in finding them ever again. I never thought that I looked over weight…but when I look at these photos, I know that I was. Thank you Dr. Lazarus and Clinical Nutrition Center! Pete has continued to see tremendous weight loss success. As of today he has lost 105.9 pounds since starting his weight loss journey.